So did you get appreciated last week? Last week was national Teacher Appreciation Week. I know most if not all of our readers are administrators but don't we all consider ourselves teachers first and foremost? I hope someone told you "Thank You" for all you do for so many ... and if no one did, I am telling you now! Thank you for the extra hours you put in no one sees. Thank you for the tears you shed when a student or staff gets very ill or even dies. Thank you for all the advocacy you do for your students, parents, teachers and district. Thank you for all the many times when half of those outside think you do too much and the other half think you do too little! Thank you for the extra money you spend out of your own pocket for donuts, coffee, classroom resources, professional membership, etc that everyone takes for granted but that you know is necessary. Thank you for stepping up to the plate and staying informed, engaged and enthusiastic in a time of rapid change! Thank you for being the backbone of so many services students with disabilities wouldn't have without you! You ARE appreciated! Have you "thanked" someone this week? I know it is early in the week, but I hope you will consider thanking someone for their extra effort today or at least this week. One way to do that is to nominate them for one of the CASE awards. While most of the awards' nominations are not due until Dec, there is one CASE award that is coming up really soon. The "G" award is only one year old and the deadline is June 15. See below to get more information or go to the CASE website! Thank one of the "new" administrators by nominating them for this award especially designed for those administrators with 3 or less years of experience. We need to encourage them to stay in the field and maybe inspire others to jump into our field! Today is the LAST day for putting in a proposal for the CASE Fall 2015 Conference! Just go to the CASE website or click here for more information! 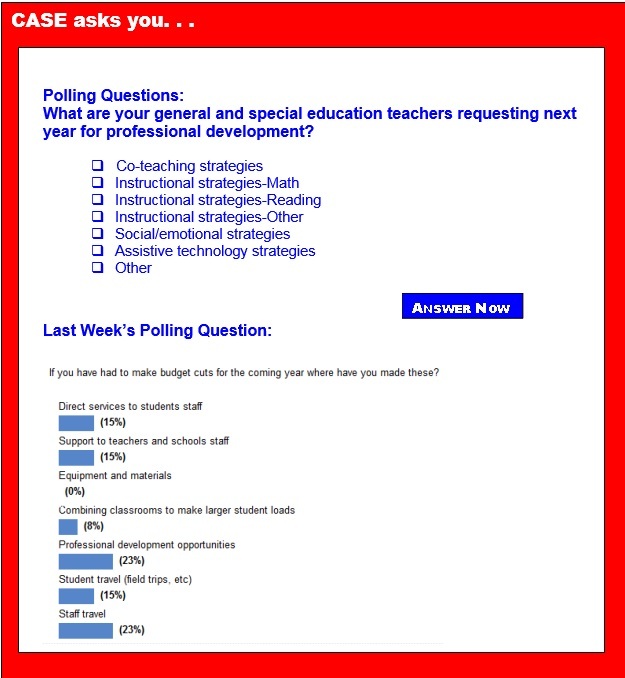 Last Week's Poll asked "If you have had to make budget cuts for the coming year, where have you made these cuts?" This week the answers were more evenly divided than in any question we have asked in a long time. First place was tied at 23 percent with two related items, cutting professional development opportunities and staff travel. There was a three way tie for second place at 15 percent with cuts being made in direct services to students staff, support to teachers and schools staff, and student travel (field trips, etc). Last place, at 8 percent, was cutting the budget by combining classes to make a large student loads. Budget cuts are a reality of life but we cannot give up on telling the story of how these budget cuts impact our students and ultimately their achievement outcomes! We hope you will make every effort possible to join your CASE and CEC colleagues in D.C. this July so you too can make personal visits to your congressional delegates and help us tell the story! Want to enhance your advocacy skills, learn about important special/gifted issues, and take CEC's messages to Capitol Hill? Then come to the Special Education Legislative Summit July 12-15 in Alexandria, VA. Registration is easy, simply visit the Special Education Legislative Summit website, click the registration tab, and either register online or download a form. We will be updating the website regularly. Join us in July! The Office of Civil Rights released a report to the President, Secretary of Education, and Congress detailing the office's activities in fiscal years (FY) 2013 and 2014. The proposal to reauthorize the Elementary and Secondary Education Act that unanimously cleared the U.S. Senate education committee includes elements that please both advocates for students with disabilities and advocates for gifted students — including a cap on the number of students who can take lower-level state assessments and be counted as proficient, and an explicit focus on using federal funds to train teachers in best practices in gifted education. In a news release to its members, the International Association for K-12 Online Learning recently announced that it has been assisting in the reauthorization of the 1965 Elementary and Secondary Education Act. The bill, known as the Every Child Achieves Act of 2015, calls for states to continue to conduct annual accountability assessments but opens the door for states to consider things like growth measures, adaptive measurements, multiple measures and assess when ready, innovative assessment flexibility, and state-led accountability. The passage of HB 7069 into law changed the rules for evaluating Florida students and teachers. Exactly how has been the subject of much debate. There's been a healthy back and forth, for instance, over whether the Legislature's action gave school districts more flexibility on retaining third graders who score at the lowest levels of the state reading test. Here's what we recently wrote, suggesting that schools hold the final decision. The Florida Stop Common Core Coalition, for one, took issue, saying we got it wrong. Structural brain differences between children with dyslexia and dysgraphia and children who are typical language learners have been observed by researchers in a recent study. Researchers say the findings prove that using a single category of learning disability to qualify for special education services is not scientifically supported. The implementation of the Common Core State Standards has been met with anxiety from administrators and educators at every level, because, like any major change, it can seem scary and overwhelming. General education teachers have had to learn and apply new instructional strategies to address the new standards and the vision that the standards embody, particularly universal design for learning. Special education teachers have been required for the first time to become pseudo subject-area experts to help struggling students and those with learning disabilities meet the standards. Typical writing evaluations are often inadequate. Knowing this may help you convince school or private evaluators that your child needs a different kind of writing evaluation, one that might use but doesn't depend on standardized tests to compare him or her to other children. Instead, outside of standardized testing, it directly examines what he or she can and can't do well and tries to identify external barriers to progress. There are several important written requests you may need to send the school. If you're faced with resistance, there are possible actions to lessen or eliminate it. Attending college, albeit fun, is challenging. Students manage plenty: deadlines, schedules, exams, finances, extracurriculars, commuting, residential life — even free time. Consider another layer of challenges for a student with disabilities: academic access. Campus offices of accessibility or disability services can be a critical resource, supporting the academic experience and working to ensure equal access to the academic environment for students with disabilities. These offices have the mission of providing accommodations to students with documented disabilities, making sure the university's environment is inclusive and welcoming, said Alsace Toure, director of disability services for students at Baldwin Wallace University. The Common Core State Standards are designed to help students build a solid foundation of knowledge and skills in preparation for both college and career. To help students meet the expectations of these more rigorous standards, it is important for educators to focus on the standards that students struggle with most. Based on i-Ready diagnostic data from more than 750,000 students, Curriculum Associates has identified four standards as the most difficult in reading and math. These findings are shared below to help educators better plan and maximize their instructional time, accelerate student progress, and create learning environments in which all students can succeed. Allowing young children to choose books they'd like to read over the summer break from school may hone their reading skills and prevent "summer slide" in reading scores, suggests new research. Kids who were allowed to select books to take home at the end of the spring term had better reading scores when they returned to school in the fall, compared to kids who received books they had not chosen, researchers found. This year was the first year that Mississippi teachers taught the Common Core standards in grades kindergarten through 12th grade. It was also the first year using a new computer-based end of year exam, which the state Board of Education voted in January to toss out after this year. And to add to the host of changes, this year was also the first for the "third-grade gate" test, which will check reading ability and prevent third graders from going to fourth grade if they can't read on grade level. The Hechinger Report sat down with Darla Miller, a third grade teacher in east Mississippi, to talk about the changes and challenges that she has experienced in this year of reforms. A long-term study shows that children who were bullied have more trouble in adulthood than children mistreated by their parents. Peers may be worse than parents when it comes to the psychological effects of disparaging words and harassment. A study published in The Lancet Psychiatry reports that children who were bullied by peers had significant mental health problems as adults — even more significant than children who were mistreated by their parents or caregivers.